As the saying goes "The day has the mishap wind and cloud, the human has the imminent fortune and misfortune", we live in this world and we have to meet some things unexpected. They could be fortune or misfortune, but they would fall upon you in a blink. I rode on my son's motorbike in June, 2004, and I fell down accidentally because of the rough road and high speed. The examination in hospital showed that I got vertebral compression fractures, bone deformation and injury of soft tissues in large area of the waist. From then on, I couldn't get up from bed and turn over the body. The severe pain tortured me ruthlessly. I couldn't sleep day and night with endless groans. I have lost the confidence on living. As all of my thoughts are blasted, I heard the information about Bluelight Eight-Diagram Therapeutic Apparatus on the radio occasionally. Frankly speaking, I was familiar with therapeutic apparatus, and I had bought several sets before. Some of them got drug bags, the others didn't. The apparatus with drug bags was very expensive in sequel cost, we couldn't afford it and the curative effect was not so good. The apparatus without drug bags could not cure diseases at all with low-frequency pulse. The Bluelight Apparatus is a product from our hometown, I had intimacy with it. Despite so, I still listened to the Bluelight lectures for several days continuously for safe. I got to know the curative effect of the Bluelight lectures indirectly. As to the real effect, I had to bought one and tried it to see the fact. My children bought a set of digital type of Bluelight Apparatus for me from Xiangfan on 2004-6-21. I treat my disease with it according to the Health Treatment Guide. I hadn't known the magical effect before I used it. My pain was alleviated after a treatment course. I could get up from bed and walk away after a month, and I could even turn over the body slowly. The unexpected effect made me very happy. I found the hope, and it strengthen my confidence on convalescence. After 2 months, I could turn over the body and get up to sit on bed freely, and I could even do some simple farm work. Owning Bluelight is equal to owning health. I had suffered from haemorrhoids for many years. The red blood could startle people which flowed out when I defecating. I had taken much medicine and spent a lot of money, but it could not be cured completely. I used Bluelight Eight-Diagram Therapeutic Apparatus to treat it for a month. It hasn't recurred until now since it was cured. My wife had suffered from gastrosia which became serious from time to time since she was young. She would take some medicine when it became serious, but she stopped the medication to do farm work when it turned better. She got to suffer from sciatica suddenly two years ago. The disease attacked very severely and she felt the pain as if she was cut by a knife. It was extremely serious to make her cry in the pain. She couldn't walk and lost labor ability. For curing her sciatica, she took hanging needle injections, had Chinese medicine pills and drank simmer medicine soup. But this doesn't cure her sciatica but worsened her stomach. The acute gastritis tortured her in faints and revival. She even decided to give up the treatment to die. Heaven never seals off all the exits, we brought the Bluelight Apparatus to our home, which was really a high-tech green product. It could be used to treat different diseases at the same time, so we would never care for this and lose that. We insisted on the treatment for 2-3 times a day without interruption. We did it 3 times a day in the slack season and 2 times a day in the morning and evening or stuck in a pin wherever there's room in the busy season-made use of every bit of time, so our efforts were fruitful. My wife's stomach problems, sciatica, knee pain, cervical spondylosis have been all cured. She appeared vigorous without illness. She can even do the farm work better than me. She is 65 years old, but she can carry two buckets of water. She said humorously "We have a family doctor, so we can get free treatment for all." 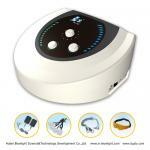 We have never gone to hospital since we bought Bluelight Eight-Diagram Therapeutic Apparatus. We can cure some petty diseases such as headaches, cold, toothaches with it very easily. Thinking back carefully now, my wife and me experienced many diseases and much misfortune in the past years, but we got good out of misfortune to walk on the road of health again unexpectedly. We thank Bluelight from the bottom of our hearts, and we raise our arms to applaud for Bluelight! We wish Bluelight could shine every corner of the world!